Calling all special needs families... you need this book. At 650 pages, it could double as fitness training equipment. The reality is, it's one of the best books I've ever seen to give you the big picture as well as the details. You'll find everything you need to talk about with your parents in planning for the future of your special needs sibling. The authors are lawyers who specialize in working with special needs families. One even has a sibling that was the reason for his initial interest. First written in 1995, this book is now in its 6th edition. If you have a special needs adult in your family, it's time to begin these conversations with your parents. This book will provide enough information to make your head spin. The idea is NOT to sit down for bed-time reading. What you need is to read through the extensive table of contents just to get the overview. Then interview your parents for which areas they have heard of or not. Next, take a calendar and skim through a chapter a week. You'll literally need that kind of discipline to work your way through this book. The information is invaluable. You'll get questions to ask that you never thought of asking. You'll get tasks to do that you never imagined were important. When you stick with it, you and your parents will put together a plan that will allow you to breathe a sigh of relief. This first time through is simply to get an overview of the range of issues and tasks that you'll need to have a thorough plan for your family. Then keep it on your shelf for a reference book that you'll consult regularly. No it's not a misprint... that's really the price. This newest version also contains 2 Audio CD's and two special reports. If you follow their advice, you're going to save tons of money, many sleepless nights, and probably keep your sessions with your own lawyers and other professionals to a minimum. I got this book from the library first. They'll probably have an older edition, but you can get the basic idea. But, you won't be able to check it out long enough to accomplish everything you need. Plus you'll end up wanting to take notes and highlight sections in the book, so you really will need your own. DO NOT buy it from Amazon, Barnes and Nobles or any other source. You'll get an older edition, and at least on Amazon, pay 3 times the price. 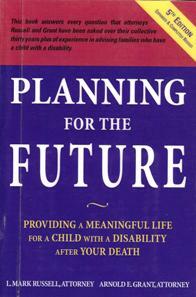 Special needs families can buy Planning for the Future from the authors. Special Needs Adults -- A special concern for aging parents. Learn to talk to your parents and siblings to prepare for your sibling's needs.